First, I'd like to say a few words about the food of northern Thailand, or Lanna, which is the name for the old northern Thai kingdom. Fun fact: Chiangmai was an autonomous principality until almost within living memory; it was only formally absorbed into the modern Thai state in the early 20th century. 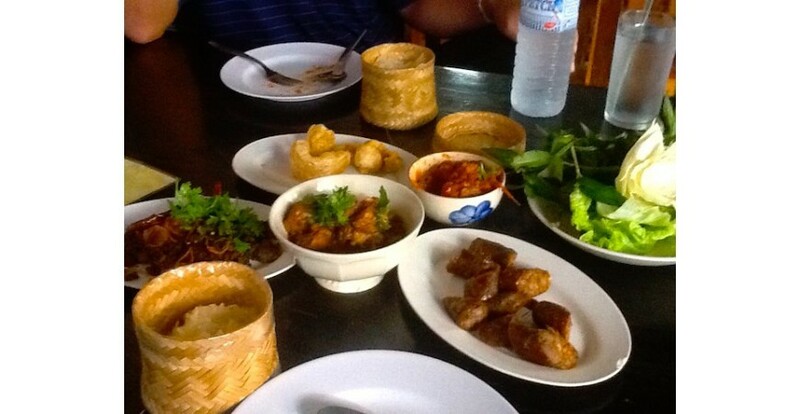 Lanna cuisine is noticeably different from that of Bangkok and the other main regions, namely Isan (the northeastern plateau) and the South. The most striking differences, in my opinion, are its relative mildness, the general absence of coconut from its curries, the prevalence of pork, and the relatively greater use of tomatoes. I'm speaking of traditional cooking, of course. Nowadays most restaurants in Chiang Mai and elsewhere in the North serve pan-Thai dishes. Like the people of Isan, the people of Lanna ate mostly sticky rice before Bangkok influence became prevalent in the 20th century. The wonderful Lanna Museum in Chiang Mai has a very informative exhibit about Lanna food and ways of eating, not to mention every other aspect of northern life. The photo below shows the museum's representation of an old-style meal. The Northerners love their pork. On a visit to Chiangmai in 2012, a Thai friend and I ate in a small restaurant near Chang Puak Gate on the outer side of the old moat and walls. The entire menu seemed to consist of pork dishes. At any rate, all our selections (pictured below) contained pork in one form or another. They included northern-style pork sausages, a mild curry with chunks of pork, a warm salad containing processed steamed pork, deep-fried pork rind, and a dipping sauce that is unique to the North. This sauce, called nam prik ong, is made from red chili, tomato, and minced pork. It's one of the most delicious things I've ever eaten in Thailand. It's in the smaller round bowl at centre. We were also served Lanna-style sticky rice in the little baskets. 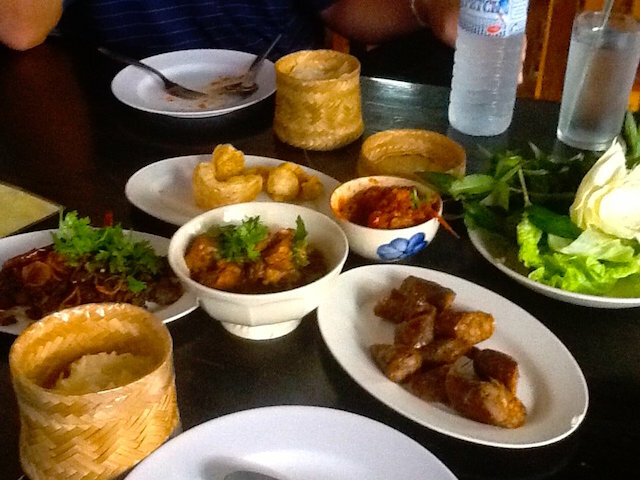 My friend, who hails from Isan, the dry northeastern plateau, had never had any of these pork dishes before, except for the sausages. Friends have recently reported that this restaurant no longer exists. I'm not surprised. The lady in charge back in 2012 seemed quite elderly. Sidenote: There was a photo of the last reigning Prince of Chiangmai, who died in 1939, on the wall at this restaurant, but no pictures of Bangkok royalty. Those who know Thailand will understand how unusual this glimpse of old loyalties is. Thais love to eat near or on water, and the Northerners are no exception. All around the country there are restaurants arranged around ponds or lakes, usually covered pavilions on stilts. On my last visit to Chiangmai, in 2015, my friends and I went to one such lakeside restaurant on the edge of the city. 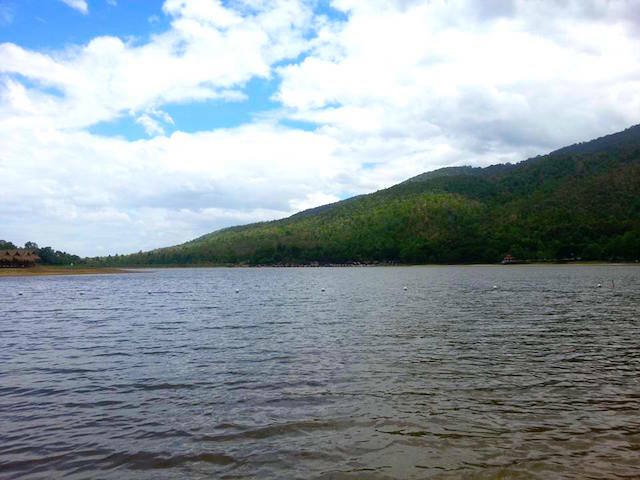 This lake is called Huay Teung Tao. If memory serves, it's in a park of some kind. The building that you see on the far shore in the picture above is part of a resort, I believe. The restaurant, the name of which I've forgotten, consists of a collection of raised bamboo pavilions along the shoreline. You sit crosslegged on the floor and eat at low tables. 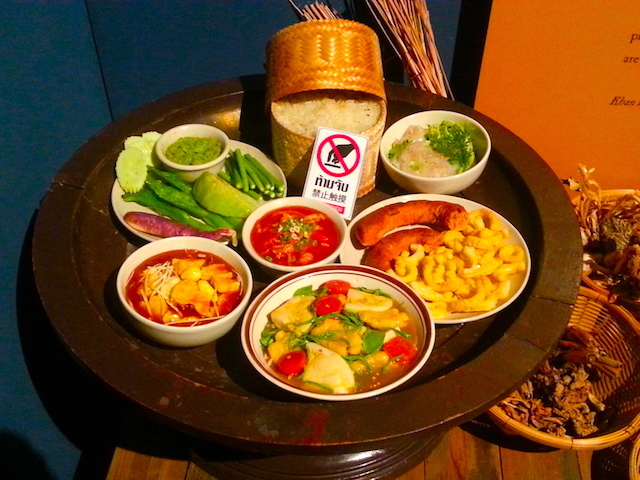 The menu offered mostly Bangkok and Isan favourites. 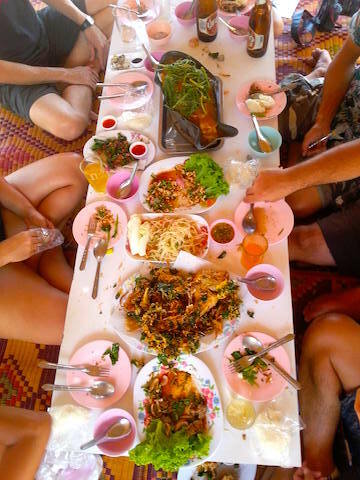 If you peer at the photo above, you'll see that we had plenty of papaya salad (somtam) and a large steamed fish -- which was not from the lake at hand. At some places like this, however, you can fish for your own meal. 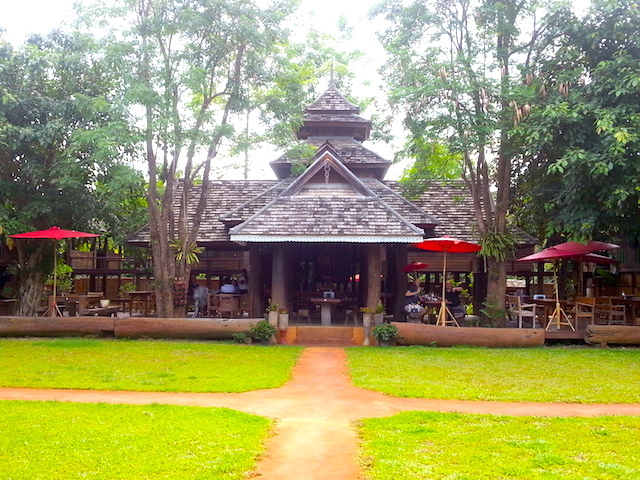 On another day on that last visit, my friends took me to the Lanna Rice Barn, a large restaurant and homestay operation specializing in Lanna-style cuisine. 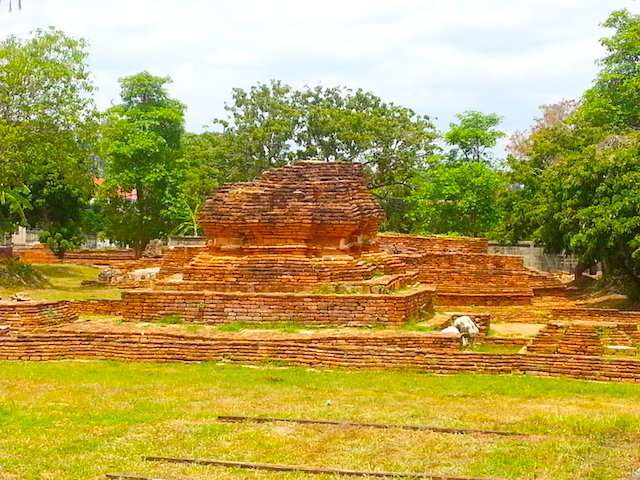 It's located about a quarter hour outside the city near the ancient Wiang Kum Kan ruins. The menu featured all the greatest hits of Northern cooking, but the setting was so charming that I would have enjoyed anything put in front of me. 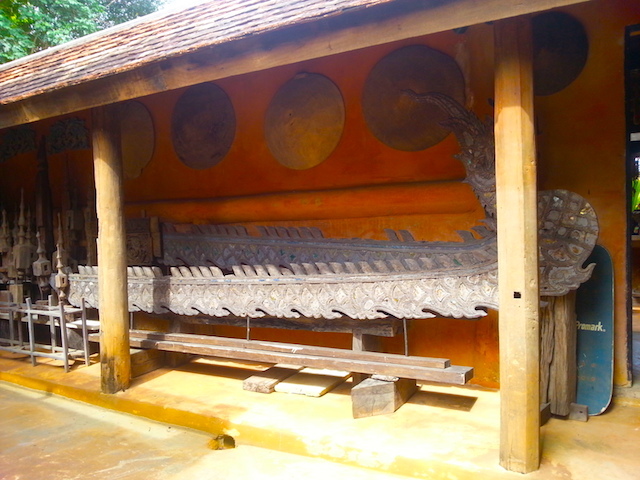 The owner is or was an architect involved in the preservation of Lanna building styles and techniques, which is apparent in the several buildings of the complex. Architectural salvage, such as temple finials (see below), are on display. I didn't ask, but they were probably for sale. Food products are definitely for sale. I bought some preserves. Lanna Rice Barn specializes in northern cuisine, but also offers pan-Thai dishes. 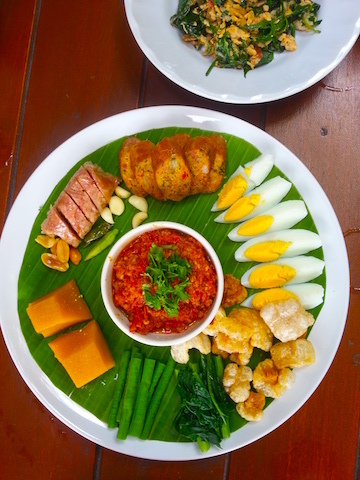 Probably the most distinctively Northern thing we ordered was the miang kham platter, which featured the above-mentioned nam plik ong, 2 kinds of sausage, eggs, and pork rind. A visit here is highly recommended if you're in the Chiangmai area. Next up: Eating in Bali! Did you know that Lotus & Persimmon has both a Facebook page and an Instagram gallery (@lotusandpersimmon)? Please like and follow. We also have items for sale, so feel free to browse the other parts of this site.